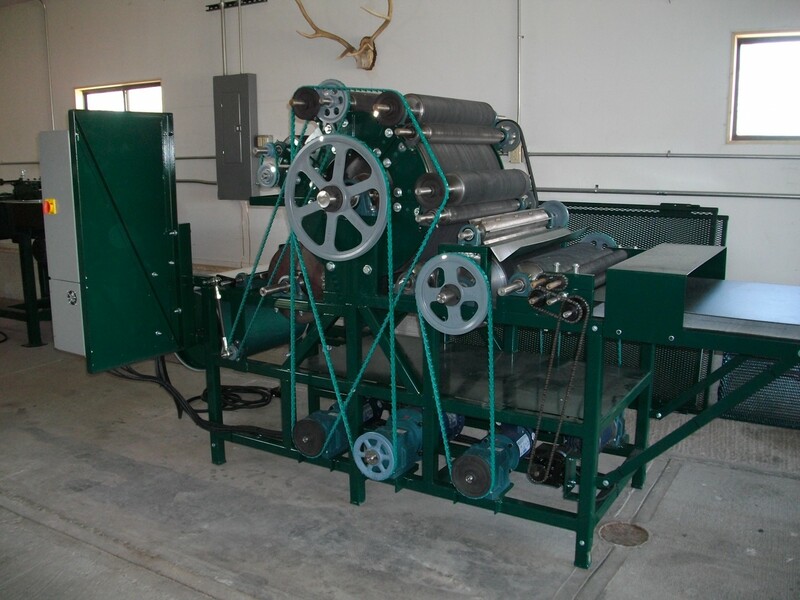 Our carding machine, built by Chuck McDermott of Stonehedge Fiber Milling Equipment, is capable of processing a wide variety of fiber types, and lengths up to 10 inches. Fibers can be carded into roving, batts, or cloud. There is no minimum size for carding orders, but batches smaller than 2 lbs will be charged as 2 lbs. We ask that first time customers include a deposit to cover the cost of carding when fiber is shipped to us. Processing charges are based on the incoming weight of the fiber and include washing, picking and carding. Please print out our Fiber Processing Form and include a completed copy with the fiber you send us. Be sure to call or email us for scheduling before sending us any fiber. Carding batts is much more time consuming than roving or cloud because the carding machine must be stopped to remove batts, and the batts need to be packaged, hence the additional charge for making batts. If we are needlefelting your batts, the additional charge is included in the felting fee. The standard weight for batts is 1 pound, unless you specify thicker or thinner. Carded batts are approximately 22″ by 46″. Examples of fine wools include: Bond, Cormo, Corriedale, Polwarth, Polypay, Rambouillet, Suffolk, Southdown, Targhee, single-coat Shetland, and some crosses of these. We do not process merino wool, as it is extremely difficult to card without noiling. We can recommend several mills that can comb your merino into top, which is a much more satisfactory product. *For Angora rabbit, Cashmere, and Suri Alpaca, see note on Special Fibers below. Note that it is not possible for us to card some exotics without adding at least 15% wool. This is usually the case with black alpaca and llama fiber. We reserve the right to add wool if needed unless you specify otherwise. We can provide fiber for you to blend with your exotics. A blending fee of $5.00/lb will be applied. This also applies to blending of colors of the same fiber, if the blend is to be maintained in precise percentages. If you just want us to pick and card two colors or two different fibers together there is no charge. If the fiber you sent contains lots of fine vegetal matter that cannot be removed by skirting, this additional fee will be charged to cover the extra wear and tear on, and time spent cleaning, our equipment. If your fiber needs more than the standard two washes and two to three rinses to come clean. Skirting fee. 15 minutes skirting (per fleece) is included in the base price. This additional charge should only apply to fleeces that have not been well skirted. We strongly recommend that you let us wash your fiber. We have had so many problems with “clean” fiber that has been sent to us that we no longer offer a lower price for washed fiber. If the fiber you have sent us is not completely grease free, we will need to re-wash it and you will be charged $5.00/lb to re-wash and then the full price to pick and card. This will be at our discretion. Please do not use fabric softener or hair conditioner when you wash the fiber. This leaves a residue behind that gums up the carder. Certain fibers, specifically Angora rabbit, Cashmere, Pygora, and Suri alpaca and blends of these fibers take much more time and effort to process. Suri alpaca generally will not be processed without blending at least 20% merino wool or some other appropriate fiber. Prices for carding Special Fibers will be in the range of $12.00-$18.00/lb. Email or call us to discuss prices for processing your specific fiber.